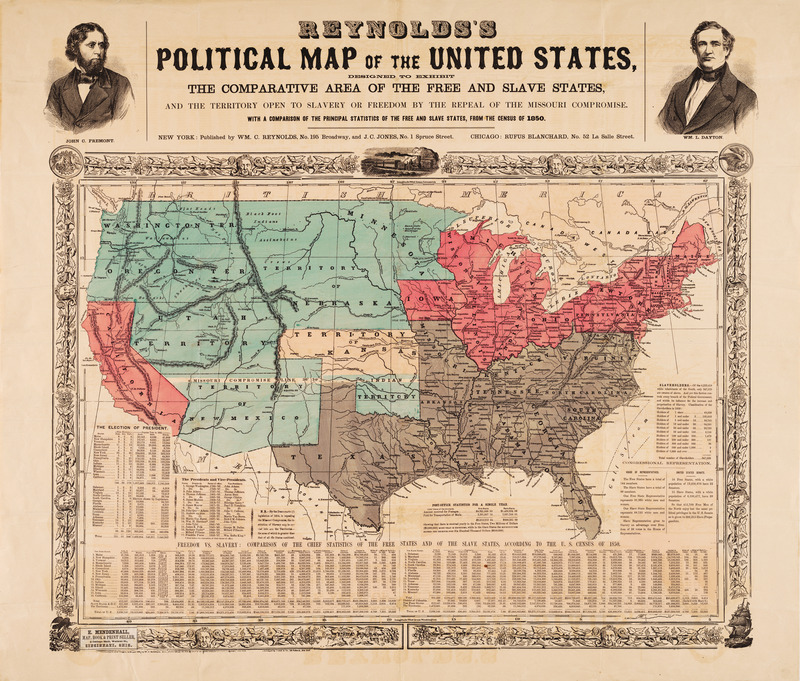 This landmark map supporting the candidacy of John Fremont played an important role in the 1856 Presidential election. It set out dramatically the stakes involved in the potential spread of slavery to the Western states, as stated in the legend below Texas: "N.B. - By the Democratic (!) legislation of 1854, repealing the Missouri Compromise, the institution of slavery may be carried into ALL the Territories - the area of which is greater than the area of all the States combined." The 1856 campaign was dominated by the question of whether or not to repeal the Kansas-Nebraska Act of 1854, which allowed new states the option to permit slavery. The Democratic candidate, James Buchanan, supported the Kansas-Nebraska Act. John C. Fremont, candidate of the new Republican party, opposed the Act, and maps like this one were an iconic feature of his campaign literature throughout (Schulten 2012, 129-130), appearing in posters, handbills, pamphlets and the candidate's official campaign biography. The collection includes six examples of the Fremont campaign map, all dated 1856: ID #2132 (the Reynolds map poster), ID #1058 (handbill with map), ID #1059 (folding map in German), ID #2101 (pamphlet with map), ID #2199 (pamphlet with map), and ID #2264 (biography with map). The map "startles the reader" (Schulten 129), in part through a number of techniques found in persuasive cartography. The color of the western territories differs dramatically from the pink of the free states, giving the impression that slavery has already (or nearly) arrived in the west. The text on the map describes the existing unfairness of congressional representation and postal expenditures, both favoring the slave states. And the map is not based on the familiar Mercator projection; the meridians converge to the north, suggesting a Sinusoidal or Azimuthal/Orthographic projection. See Snyder 1989. As a result, the relative size of the northern states is reduced and that of the southern states is increased, as if the globe is being viewed from above the southern states, foreshortening the northern ones.